This Tuesday I'm craving the blitzkrieg of dots as they come into their annual spotlight for the spring season. Something about polka dots rings true in fashion from a fish-faced Valentine's date through the first sunset of summer (when stripes will ensue.) Perhaps it's their lightheartedness —I mean, who would take you seriously if you were a spot?— or the quirky way they've inched into our hearts via their resemblance of a long-lost relative's awkward sweater, the childhood trauma of your first birthday clown (hey, some of us are masochists with our fashion), or simply the adorable dalmatian puppy in the cornershop window you never had the chance to own. 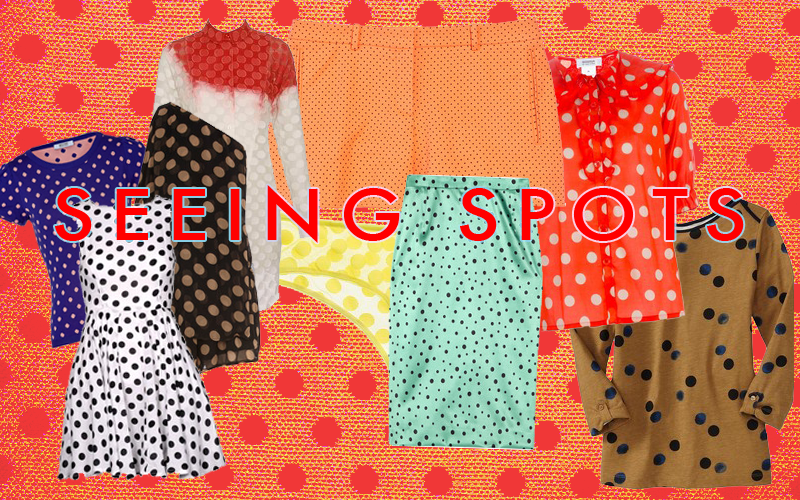 Whatever the reason, polka dot prints are here to stay — for another few months or so. Pictured: Moschino C&C blue polka dot top, AX Paris polka dot skater dress, Dorothy Perkins black polka dot playsuit, Ostwald Helgason dip-dyed polka dots shirtdress, Versace polka dot microshorts, Madewell Honeydew Intimates polka dot undies, Dolce & Gabbana polka dot skirt, Sonia Rykiel polka dot top, Old Navy polka dot boatneck tee.